In addition to the powerful database parsing, generation, and population capabilities that IRI RowGen provides for synthesizing structurally and referentially correct test tata, you can now also produce (and mask) database subsets. 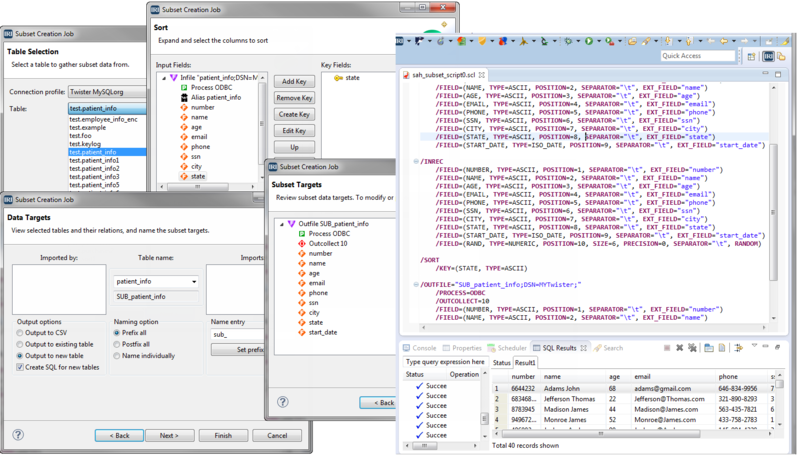 A proven, powerful Database Subsetting wizard is inside IRI Workbench, the free Eclipse IDE for users of the IRI Voracity platform or IRI Data Protector Suite software products (which include IRI FieldShield and/or RowGen). This ergonomic utility allows you to rapidly create custom-size subsets of manageable, referentially correct data determined by your master table, and apply consistent data masking and/or mapping rules to all the subset tables at the same time. Subsetting not only minimizes the risk of PII exposure and privacy law violations, but dramatically lowers the costs of database and application testing infrastructures ... some say as much as $50,000 per database. Learn how to automatically set-up, and create subsetting jobs in Workbench here.